Director David Gordon Green has a long history with the Toronto International Film Festival, beginning with his debut feature film George Washington winning the Discovery Award in 2000. Since then many of his films have premiered in Toronto. He was back again this year with perhaps his most high-profile film to date. 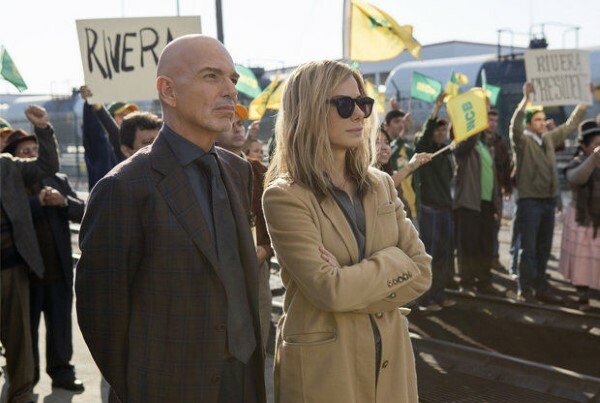 Starring Sandra Bullock and Billy Bob Thornton, Our Brand is Crisis is a fictional film based off a documentary of the same name about presidential candidates in Bolivia that hire American political strategists to help them win. The director is better here than in his last couple of films but it is Bullock who saves this one from being a complete letdown. ‘Calamity’ Jane Bodine (Sandra Bullock) nicknamed for her tendency to lose the elections for her candidates, has retired from the life of a political strategist. She is approached by fellow colleagues who attempt to convince her to take on a job in a Bolivian Presidential election. She reluctantly agrees after she finds out the opponent has hired his own American strategist named Pat Candy (Billy Bob Thornton), her rival that always beats her. After flying to South America with her team, she meets her candidate Pedro Gallo (Joaquim de Almeida) and learns that he has significant ground to gain. Her initial approach to the election is not working and instead of trying to make the man fit the narrative, she changes the narrative message to better fit Gallo’s personality and political style. He begins to soar in the polls, facing dirty tricks from her opponent and angry protests from the citizens of the country. All of Jane’s work brings her candidate within striking distance of the win and the election comes down to the wire in an exciting finish. After the election is over, she is left wondering if she made the correct choices. I am reluctant to continue giving David Gordon Green chances with his films. I was very impressed with his earlier work and so followed his career but continually his films feel that something is not quite there, like a piece of the puzzle is missing. I will say this film is better than his past couple of outings but even still it does not match the level of brilliance of his early career. This one came into the festival with high anticipation but ended up disappointing many. The real star element of this movie is Sandra Bullock’s performance. For any fans of her sarcastic wit and snappy dialogue delivery, they won’t be disappointed. She is charming and lovable despite being a deeply flawed character. Her performance gives the film a really great sense of humour that lifts it out of being a complete miss. Some compared her performance here to her hit romcom movie Miss Congeniality but unfortunately, with what the director was going for, that’s not a compliment for this film. This is an interesting film that certainly raises complex moral questions about the nature of politics and elections. It is enjoyable and funny but it does not live up to the lofty expectations placed upon it by critics speculating it would be an Oscar contender. Going forward, I will have to think long and hard about whether or not I will continue supporting this director’s films and career. He just seems to continue disappointing me as he tries so very hard to recapture the subtle brilliance of his early films but ultimately falls short. Read all of our ongoing coverage of TIFF 2015, including Film Reviews & More.